Coconut milk is a wonderful ingredient to use in vegan cooking as it provides a light amount of flavor, along with a nice dose of fat, adding richness and creaminess to many foods. Depending on how it is used, the coconut flavor can easily be enhanced or easily masked with other flavors in both sweet and savory applications. Available in both canned and cartons, the differences between the two are notable, but either can be used wherever non-dairy milk is called for. You can also make your own coconut milk at home by straining freshly grated coconut meat through cheesecloth. Even though it comes straight from a coconut, coconut milk resembles many other non-dairy kinds of milk in sweetness, taste, and texture, with only slight coconut undertones. This type of coconut milk (full fat) is a fabulous substitute for heavy cream in many recipes, as it is high in fat content and imparts a very rich texture to recipes such as sauces, puddings, curries, vegan ice cream, and more. Lite coconut milk is also available and works well for recipes where fat content isn’t as important. Coconut milk is very common in Southeast Asian cooking and dessert making, and while high in saturated fat, also boasts nutrients such as calcium, iron, protein, folate, and Vitamin C.
One pretty neat feature of canned coconut milk is that it can easily be transformed into coconut cream. Simply place a can of coconut milk (it must be full fat) inside of your refrigerator and let rest overnight. Then, open the can as normal and scrape off the solids that have risen to the top of the can. Mix this cream with a touch of sweetener for an easy vegan whipped cream or use wherever coconut cream is needed. The remaining liquid can be used in cooking or added to smoothies. 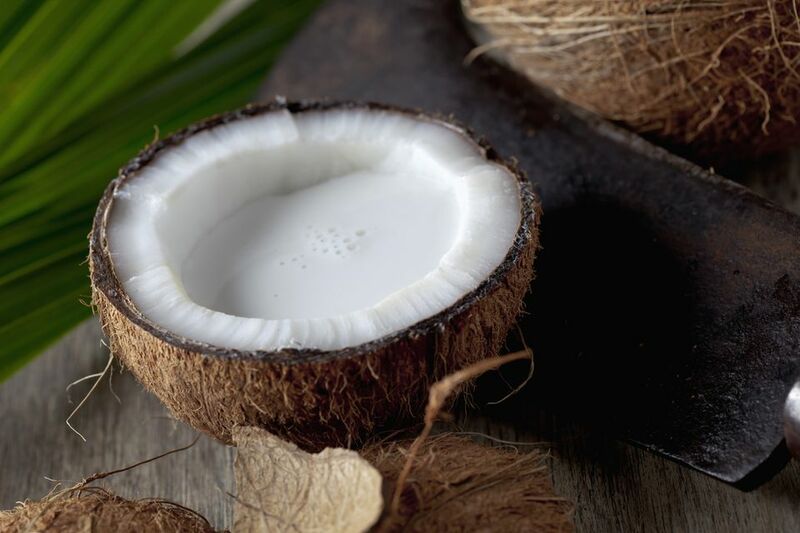 Found in the refrigerated sections of many grocery stores along with other non-dairy milk such as ​soy milk and almond milk, coconut milk is quickly gaining popularity as an alternative to cow’s milk. You can use this milk just as you would dairy or non-dairy milk: in cooking, baking, cereal topping, and simply for drinking. Although primarily made from coconut meat and water, many brands also have a variety of additives, such as carrageenan or other non-dairy milk, and are usually fortified with vitamins and minerals, including B-12, which can be scarce in a vegan diet without fortified foods or supplements. This type of coconut milk is lower in both calories and fat than the canned variety but doesn’t yield the same results as the full-fat canned milk when making creamy desserts such as vegan ice cream.